Easy density measurement of not only solid and liquid sample density, but added functionality to measure powder density with resolution of 0.001g/cm3 and reference value of 0.0001g/cm3. Newly designed sensor and auto-weighing function for improved accuracy and working efficiency. 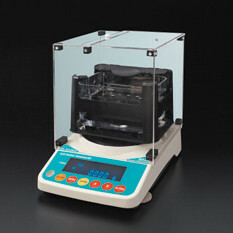 Higher accuracy with resolution of 0.001g/cm3, and reference value of 0.0001g/cm3 can be displayed. No need to open and close lid with newly designed sensor. New function for powder density substituted measurement. Density variation of absorbent samples can be measured. 5 modes for time measurement. Floating objects and pellets can be measured easily. Density resolution 0.001g/cm3 and reference value of 0.0001g/cm3. Able to measure compensated liquid density.